It is extremely important that the subject of Scriptural baptism be addressed and clarified in our time. This little booklet cannot possibly do complete justice to the subject itself. It will scratch the surface, however, of that which has been clouded and myopically redefined by the Protestant influence upon Baptists. In generations not too distant, the striding gains of apostasy and modernism caused a backlash of reaction among conservative Protestants. A fledgling movement drew a minority within various denominations who banded together under the flag of Fundamentalism. Their tune of militancy for the faith was welcome among those who had seen the decline of its fervency in America. It rang loudly in the Baptist camp also; resting from centuries of persecution by Catholicism and its Protestant reformers alike. The cadence of fundamentalism boasted a united militancy for basic key truths. Baptists began to swell its ranks. They filled its schools, learned its doctrine, shared its pulpits and funded its cause. Fundamental Baptist schools were founded and staffed by these that now boasted Baptist polity with Protestant ecclesiology. Meanwhile, their prime distinction became diminished and redefined beneath a larger flag. Nevertheless, many clung to the optimistic thought that the true root of fundamentalism was fidelity to every word of the King James Bible. They thought this root would ultimately prevail to the purifying of their mingled movement. 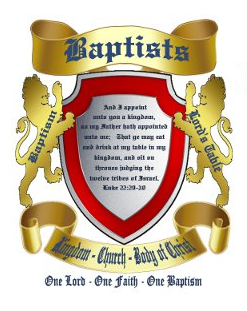 While “fundamental Baptists” declared fidelity to Baptist identity, the fruit of their spiritual fornication produced a generation that spake with a Baptist tongue and a Protestant dictionary. Thus, the lessons of Scripture and history are repeatedly demonstrated. Fundamentalism did not produce Baptists from Protestants. It produced Protestants with a Baptist name. What centuries of persecution could not do, the Trojan horse of fundamentalism did magnificently. We now find ourselves once again defending the same Biblical truths for which Baptist martyrs suffered. Today, however, it is with brethren that identify with our name and heritage who despise the Bible doctrine that distinguished both.